Can you own a name? GMA Accessories, Inc. is claiming to own the trademark “Charlotte” and has filed suit against London-based accessories brand Charlotte Olympia and an array of its biggest stockists, alleging that the London-based footwear brand is “knowingly and intentionally” infringing its trademark. New York-based GMA, which, until recently held federal trademark registrations for the word “Charlotte” for use on clothing, footwear, and jewelry, has escalated a four-year long battle over the right to the name, and has named Nordstrom, Bergdorf Goodman, Macy’s and Hudson’s Bay in its lawsuit for trademark infringement and false designation of origin. Additionally, according to GMA’s complaint, which was filed last week in the U.S. District Court for the Southern District of New York, it is also seeking to appeal the U.S. Patent and Trademark Office (“USPTO”)’s Trademark Trial and Appeals Board (“TTAB”)’s decision to invalidate its trademarks. Over the past four years, in addition to collaborating with Agent Provocateur, Havaianas, Matel (for a Barbie collection), and Marvel (for Spider Man-themed accessories), and opening a handful of new brick-and-mortar stores in in Bangkok, Las Vegas, London and Southern California, Charlotte Olympia has been fighting a battle against GMA, which has been attempting to prevent it from registering its CHARLOTTE OLYMPIA trademark. This battle got its roots in 2011 when Charlotte Olympia filed an application with the USPTO to register the CHARLOTTE OLYMPIA trademark for use on various types of goods, including jewelry and footwear. However, before a mark may be registered with the USPTO, it must be published for opposition, giving any party who believes it may be damaged by registration of the mark a chance to oppose it. In June 2013, GMA did just that: It filed an opposition to the Charlotte Olympia’s application, alleging that the CHARLOTTE OLYMPIA mark is confusingly similar to its own then-registered trademarks for “Charlotte” for use on clothing, jewelry, and footwear, among other things. (Opposition No. 91211164). 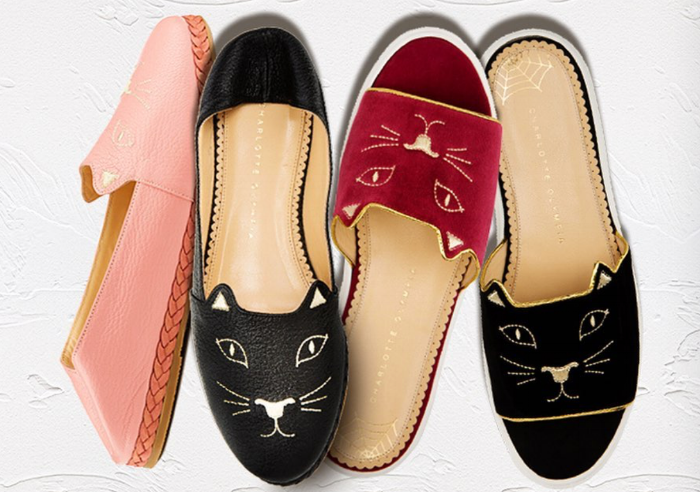 In response to GMA’s opposition, Charlotte Olympia’s counsel – the trademark team at New York-based Pryor Cashman – filed a counterclaim, seeking to cancel two of GMA’s “Charlotte” trademarks, arguing that by not using the marks for “at least three consecutive years with the intent not to resume such use,” it had abandoned the marks. (Note: In order to maintain trademark rights in the U.S., you have to actually use the marks on all of the types of goods/services listed on your trademark registration). Charlotte Olympia’s counsel noted in its trial brief that instead of actually using the “Charlotte” trademark on goods, such as clothing, footwear, and jewelry, GMA has taken to suing others for using marks that include the word “Charlotte.” Over the past several years alone, GMA has initiated trademark opposition proceedings against a handful of companies, including designer Charlotte Ronson and well-known makeup artist Charlotte Tilbury in the relatively recent past, among others. In saying so, Charlotte Olympia’s counsel is seemingly suggesting that GMA operates more like a troll – an entity that does not actually use its trademarks but instead, tries to make money off of them by threatening to sue (i.e. demanding a license fee from) anyone who could arguably be said to be using them without permission (or "infringing them") – than a brand known for selling clothing, jewelry and/or footwear under the “Charlotte” trademark. As such, the TTAB granted Charlotte Olympia’s counterclaim, cancelling GMA’s two CHARLOTTE marks. Additionally, it also did away with GMA’s opposition against Charlotte Olympia’s pending trademark registration, since, without its “Charlotte” trademarks in the classes that cover footwear and jewelry, GMA lacks a basis to claim confusion with Charlotte Olympia’s application. GMA continues on to allege in its complaint that “instead of requesting permission to use the CHARLOTTE mark or selecting a different mark, [Charlotte Olympia] decided to infringe, and/or turned a blind eye to the rights of [GMA].” As a result, Charlotte Olympia is allegedly causing confusion amongst both “retail store buyers and consumers,” thereby giving rise to trademark infringement. With the foregoing in mind, GMA believes it is entitled to “recover [Charlotte Olympia’s] profits arising from its acts of trademark infringement and false designation of origin,” and to injunctive relief, which would immediately and permanently bar Charlotte Olympia from using the word “Charlotte” in any products and marketing materials. * The case is GMA Accessories, Inc. v. Charlotte Olympia Holdings Limited, et al, 1:17-cv-06049 (SDNY).